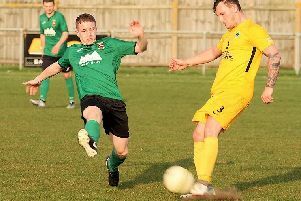 Railway Athletic and Ruskington Rovers played out a draw on Saturday. Their Boston Saturday League Workforce Unlimited Premier Division contest finished 1-1 at Garfitts Lane. Railway Athletic (blue) v Ruskington Rovers (red). Olly Walker. Railway Athletic (blue) v Ruskington Rovers (red). Harry Cramfield (blue), Ash Farmer (red). Railway Athletic (blue) v Ruskington Rovers (red). Curtis Yateman (blue), Robert Parker-Meadows (red). Railway Athletic (blue) v Ruskington Rovers (red). Luke Smith. Railway Athletic (blue) v Ruskington Rovers (red). Blake Reid. Railway Athletic (blue) v Ruskington Rovers (red). Railway Athletic (blue) v Ruskington Rovers (red). Liam Tait. Railway Athletic (blue) v Ruskington Rovers (red). Ash Farmer. Railway Athletic (blue) v Ruskington Rovers (red). Sam Jackson.